Where did they go? : Pennsylvania death certificates, no. 3. In the 1880 census of Springhill township, Wilson County: Limbrick Hinnant, 22, and Zana, 33, Thomas, 12, Rome, 10, and Exum Creech, 8, all servants in the household of white farmer Wiley T. Williamson. The death certificates of brothers Jesse and George Winstead both list their birthplace as Elm City, which is firmly in Wilson County. However, census and other records suggest that, while Elm City was their postal address, the Winstead family in fact lived inside the Nash County line. In the 1900 census of Coopers, Nash County: farmer Charles Winstead, 56, wife Rhoda, 45, and children James, 28, a farmer, Anna, 26, Lucy, 23, George, 21, Nora, 19, Amanda, 17, Addie, 15, Mollie, 12, Charley, 10, and Jesse, 8, all farm laborers, and widowed father Peter, 85. In the 1910 census of Taylors township, Wilson County: carpenter Samuel Rowe, 74, wife Louisa, 62, and daughter Farrebe, 23. On 17 April 1919, Van Cates, 33, of Taylors township, son of John and Frances Cates, both deceased, married Fereby Rowe, 33, of Wilson, daughter of Sam and Lou Rowe. In the 1930 census of Taylors township, Wilson County: Van Kates, 42, wife Phereby, 46, son George, 17, and boarders William Flemming, 52, and Rosevelt Bains, 17. Pennsylvania veteran’s comp benefits, no. 2. On 21 May 1912, John Latham of Elm City, 24, son of Isham and Winnie Latham, married Nina Gaston, 22, daughter of George A. and Pricilla Gaston in Elm City, Toisnot township. In the 1900 census of Philadelphia, Pennsylvania: at 1320 Wood Street, Solomon Merritt, 39, wife Amanda, 40, and sons Robert, 20, and Kinney, 16, all born in North Carolina. Dave Sharpton registered for the World War I draft in Wilson County. His 1917 registration shows that he was born in 1890, but reports his birthplace as Augusta, Georgia. His occupation: “prisoner.” Sharpton signed his card with an X, but by 1934 he was confident enough to pen his signature. In the 1900 census of Wilson, Wilson County: Jacob Tucker, 39, 40, wife Mary, 39, and children Doward, 17, Daniel, 15, Thomas, 13, Henry, 12, Smoot, 9, Walter, 7, Patience, 5, Joseph, 2, and Besse, 11 months. In the 1900 census of Wilson township, Wilson County: farmer James Allen, 27; wife Clara, 23; and children Howard, 7, Etta, 5, Clara, 4, Iredell, 3, and Dowell, 5 months. but returned permanently to North Carolina after the war. In the 1930 census of Town of Wilson, Wilson township, Wilson County: Paul Farmer, 44, wife Cora, 35, and children Pauline, 4 1/2, Fredrick, 2, John W., 1 1/2, and lodger Harvey Wilson, 17. In the 1900 census of Town of Wilson, Wilson township, North Carolina: 44 year-old barber John Gaston, [second] wife Sabrina, 22, and children Theodore, 13, Cicero, 10, George, 8, and Caroline, 2 months. Also in the Town of Wilson, 30 year-old divorcee Ella Gaston with sons Ralph, 10, and Albert, 2. 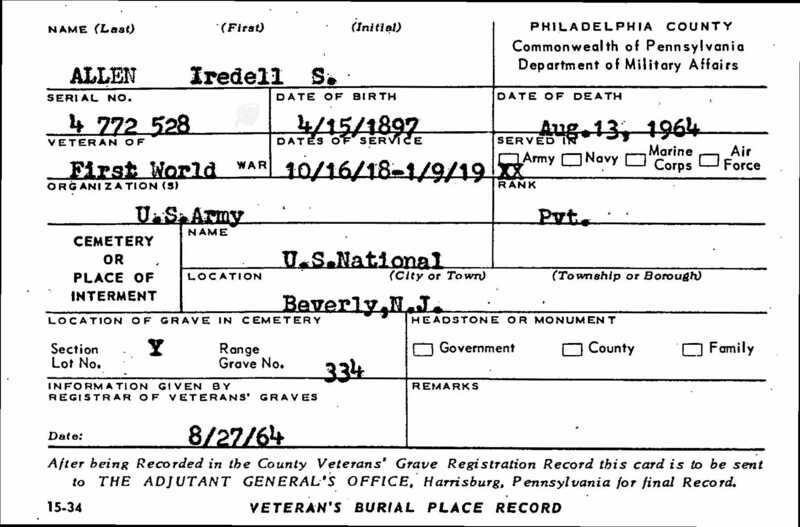 Pennsylvania, WWI Veterans Service and Compensation Files, 1917-1919, 1934-1948 [database on-line], http://www.ancestry.com; Pennsylvania, Veterans Burial Cards, 1777-2012 [database on-line], http://www.ancestry.com; U.S. World War I Draft Registration Cards, 1917-1918 [database on-line], http://www.ancestry.com. Where did they go? : Pennsylvania death certificates, no. 2. In the 1910 census of Wilson, Wilson County, on Viola Street: 37 year-old oil mill laborer Wiley Barefoot, wife Maggie, 35, and children Linwood, 15, Mike, 14, Matha, 10, Essiemay, 3, Hubert, 4, and Angly B. Barefoot, 2. Maggie worked as a washerwoman, Linwood as a “prentice carpenter,” and Mike as an odd jobs laborer. Michael Barefoot was the brother of Hubert Barefoot, above. 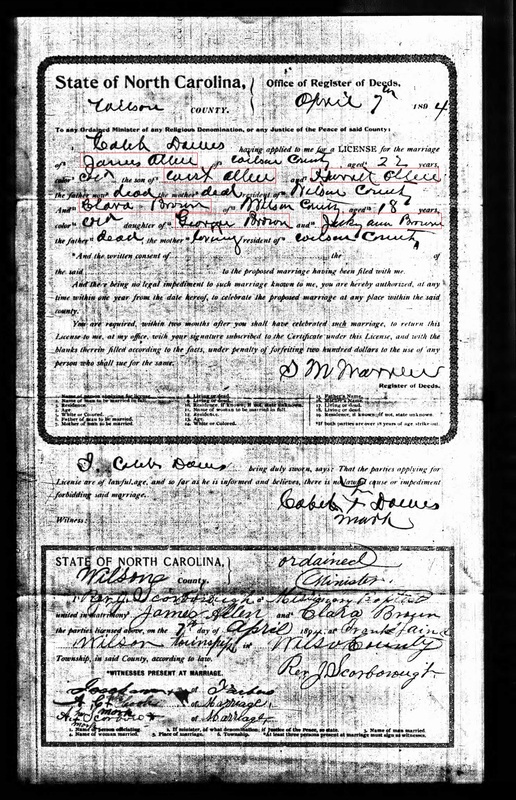 The death certificate of their father Wiley Barefoot, filed in 1952 in Wilson County, reveals their grandparents to have been Michael and Caroline Barnes Barefoot. Where did they go? : Pennsylvania death certificates, no. 1. James I. Allen appears in the 1880 census of Wilson, Wilson County, with parents West and Harriet Allen; siblings Boston, Susan, Cornelius, John, Lettice and Effie Allen; and grandmother Harriet Allen. 1880 census, Wilson, Wilson County. In 1894, James Allen and Clara Brown, below, were married by a Missionary Baptist minister in Wilson. Per Wikipedia, “Whitesboro [New Jersey] was founded about 1901 by the Equitable Industrial Association, which had prominent black American investors including Paul Laurence Dunbar, the educator Booker T. Washington and George Henry White, the leading investor and namesake. He was an attorney who had moved to Philadelphia after serving as the last black Republican congressman representing North Carolina’s 2nd congressional district. White and his fellow entrepreneurs wanted to create a self-reliant community for blacks, without the discrimination faced the southern states. Shares in the planned community were sold to African Americans from North and South Carolina and Virginia.” Samuel H. Vick was an investor in Whitesboro. This is possibly the five year-old Warren Barnes listed in the household of Peter, 32, and Lizzie Barnes, 34, in the 1880 census of Stantonsburg township, Wilson County.